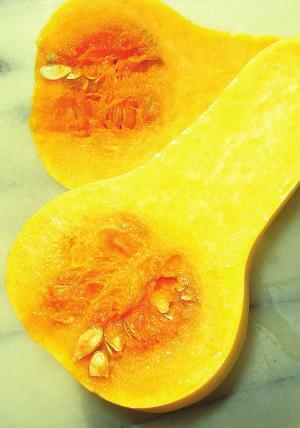 Butternut Squash is a relatively new addition to the UK market but can now be found in the majority of supermarkets. It is the heart friendly choice in vegetables being low in fat, contains no saturated fats or cholesterol and provides a rich source of dietary fibre. Rich in vitamin A it is a powerful natural anti-oxidant that is required by the body for maintaining the integrity of skin and mucus membranes. It is also an essential vitamin for vision. Research studies suggest that natural foods rich in vitamin A helps the body protect against lung and oral cavity cancers. Butternut squash provides significant amounts of potassium, which is important for bone health, and vitamin B6, essential for the proper functioning of both the nervous and immune systems. The foliate content supplies yet another boost to its heart-healthy reputation and helps guard against brain and spinal-cord-related birth defects such as spina bifida. The squashes orange colour is a definite indication butternut's most noteworthy health perk. The colour signals an abundance of powerhouse nutrients known as carotenoids, shown to protect against heart disease. In particular, it boasts very high levels of beta-carotene (which your body automatically converts to vitamin A), identified as a deterrent against breast cancer and age-related macular degeneration, as well as a supporter of healthy lung development in foetuses and new-borns. What's more, with only a 1-cup serving, you get nearly half the recommended daily dose of antioxidant-rich vitamin C.
Finally, butternut squash, because of its high antioxidant content, may contain anti-inflammatory effects. Incorporating more of this hearty winter staple into your diet could help reduce risk of inflammation-related disorders such as rheumatoid arthritis and asthma.